Project obstacles and solutions: Capitol View is a mixed-use, multi-building 32-acre development in the North Gulch area of Nashville, Tennessee. The campus is being developed as a hub of business and high-end-urban-residential living. 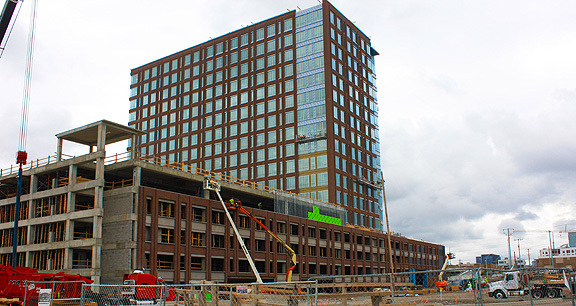 Hospital manager HCA Holdings announced that it was moving 2,000 employees and three of its divisions into the North Gulch Tower, a 16-level facility within the Capitol View development. The tower will be a central piece to the Capitol View landscape, surrounded by outer buildings. It offers 500,000 square feet of office space and 30,000 square feet of retail space. The facility also includes a parking garage. Skanska was named as the general contractor for this project. The floors of elevated decks in the tower were constructed with lightweight concrete that was reinforced with post-tensioned cables. Lightweight concrete is often used in high-rise construction to reduce the amount of structural steel needed to support the floors. The concrete is mixed with a processed coarse aggregate stone that has been heated in a kiln. This process expands natural gases in the stone, which produces air pockets throughout its consistency. This reduces the weight of the stone. To properly hydrate cement in concrete, lightweight stone is soaked in water for several hours prior to being mixed in the concrete. This fills the air pockets with water. Here lies the challenging part of building upper decks with post-tensioned, lightweight concrete. To achieve the early strength needed to pull the tendons in 24 hours, the water-to-cement ratio had to be kept low. With too much water, early strength gain is slowed. IMI QC/QA did extensive testing with this mix to ensure that early strength was being achieved and the cement was being properly hydrated and activated in the lightweight mix. This mix also used a polypropylene macro-fiber as a secondary reinforcement in the floors. IMI supplied 6,000 yards for the North Gulch Tower. HCA opened its new offices in December 2016. For more information on building decks with lightweight concrete, contact the sales representative for the concrete plant nearest your location. Click here.